Florida State Seminoles quarterback Jameis Winston received 49 out of 56 votes cast by AP Top 25 college football poll voters. TALLAHASSEE, Fla. (AP) — Seminole football fans should send a thank you note to Florida State’s baseball program. If not for coach Mike Martin Sr. and one of his assistants, Mike Martin Jr., Winston — a two-sport athlete — might not be preparing to lead the No.1-ranked Seminoles against No. 2 Auburn in the BCS championship game Jan. 6 with the opportunity to bring a third national title back to the Florida State campus. When Winston won the Heisman he thanked the usual cast of family, coaches and teammates. Then there was the thanks to "Eleven" and "Meat." Most of the country ignored the peculiar names, but Winston wouldn’t have attended Florida State without the warm relationship between football coach Jimbo Fisher and the Florida State baseball coaching staff. "Eleven" — otherwise known as baseball coach Martin Sr., who has led the program for 34 years, and "Meat" — Martin Jr.
Martin Jr. was on a recruiting trip to watch Winston during his junior year of high school when he called to let Fisher know. Fisher actually had tape of Winston on his desk at the time and decided to put it in. About 30 minutes later, Fisher called Martin Jr. back and said, "Don’t let him get away." Fisher covets players that come from diverse backgrounds where football wasn’t their only sport. He actively looks for athletes that play numerous positions on the football field and play different sports. "Every time you compete you learn something about yourself. I think it’s very good for athletes to do. I wish more athletes were multi-sport guys than they are now." Winston is the first Florida State player to win the award, which has been handed out since 1998, and the first from the Atlantic Coast Conference. Florida State and Winston continued to excel despite a sexual assault investigation that became public last month. The State Attorney’s Office announced that it would not press charges before the ACC championship game. Bo Jackson, the 1985 Heisman winner, was also a two-sport star from Winston’s hometown of Bessemer, Ala. 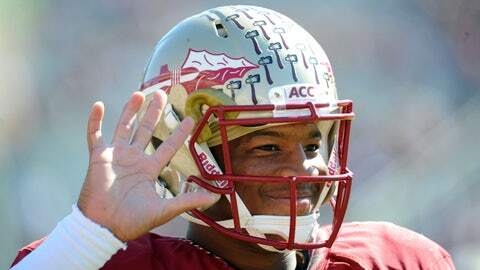 The 19-year-old Winston said after the Heisman ceremony that he wants to better than Jackson. The Texas Rangers drafted Winston in the 15th round of the 2012 MLB draft, but he elected to go to school. Martin Sr. believes Winston could be the No. 1 overall pick in the MLB draft if he was to singularly focus on baseball, but the coach doesn’t want that. He sees Winston as a first-round pick in both baseball and football. "I never want him to devote full time to baseball because then I would miss out on his talent in football," Martin Sr. said. "He’s just one of those rare athletes that only come around once in a blue moon." "So when I throw a touchdown I’ll celebrate and whatnot but when I throw a pick I keep my head up and say my fault guys and move on and keep stuff going. Baseball helped me with that."